High bay lighting is an industry standard term for the more heavy duty types of light fitting. These high bays are specifically designed to be used in very high areas from 20 to 40 ft. and to provide evenly distributed, uniform lighting for open areas. These high bay lights are used in spaces like manufacturing, industrial facilities, gymnasiums, warehouses, large department stores, factories, school and municipal facilities like community centers or recreation centers and commercial applications like department stores. Because these facilities are typically vast and cover a great deal of vertical as well as horizontal space, they require powerful lighting to provide the appropriate foot-candle levels to adequately illuminate. A particular consideration for use with a high bay light is if it can illuminate vertical surfaces as well as have it illuminate the floor, or working plane. Lighting of verticals is particularly important when dealing with warehouses where items are required to be picked from a shelf. Typically, high bay lighting fixtures hang from the ceiling via hooks, chains or pendants, or they may be fixed to the ceiling directly (similar to troffer lights). For many years other lights have been used to illuminate vast spaces. These include Metal Halide (MH), High Pressure Sodium (HPS), and fluorescent lighting. You might wonder why LED high bay lights are the most suitable for most high bay lighting requirements. 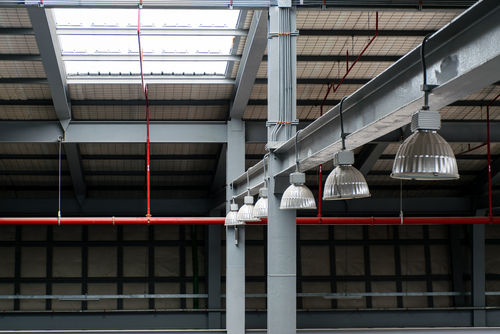 Here are some comparative points about industrial LED high bay lighting in contrast to its conventional counterparts. Take note that industrial LED lighting can easily outperform its conventional counterparts in essential ways. If you’ve ever been to a ballgame, chances are that the lights illuminating the field are metal halide. Most of MH lamps are common in sporting and warehouse/industrial uses as well as any setting where large, high spaces need to be illuminated. The benefits of MH lights include decent color rendering and comparatively adequate foot-candle levels (as opposed to other types of conventional bulbs). But they do have major drawbacks. MH lamps take a long time to warm up (sometimes as much as 15-30 minutes); they are expensive to maintain; their failure characteristics include flickering on and off; and very importantly much of the energy they produce is wasted as heat. HPS lights are often used in warehouse, industrial, business, and recreational facilities where high bay lighting is appropriate. They possess several benefits. To begin with, they are relatively inexpensive. They possess high energy efficiency which means that they have low operating costs. And quite notably they have a relatively long lifespan. Although HPS lighting technology retains these advantages over most conventional bulbs they lose on all three counts to LED high bay lighting. The downsides of HPS bulbs include the worst color rendering on the market and a fairly long warm up period. LED light possess excellent color rendering and do not exhibit long warm up periods. High performance LED high bay lighting is the lighting solution for a huge range of applications and various mounting heights. What makes LED high bay lighting the ideal solution for commercial, industrial, and recreational applications are the choice of lumen outputs and the precision-designed optics. The mounting height for this technology would be suitable for pendant and row mounting. It also has stainless steel clips, chain or stem mount. LED high bay lighting features designed optics available in multiple distributions which means that it has been designed to satisfy multiple mounting heights including low bay applications. It also provides exceptional optical performance via its low brightness, low power module assembly. The enhanced benefits of LED lighting include energy savings, extended system life, and reduction in carbon footprint. WORLDBOND LED lighting systems offers LED high bay lighting system designed to be used for large areas and manufactured to your specific requirement with excellent lighting quality and long life of the system. Have a question regarding High Bay lighting or any LED lighting system? Visit our website at www.pentech.com or better yet call us at Peninsula Technical Sales 650-965-36366 or e-mail us sales@pentech.com.